This month's Carnival of Homeschooling is up at Home Spun Juggling. Some of my favorite moments spent learning with my kids have been during walks at parks and nature preserves. There is something about walking under the trees and along the trails that brings out the best in us. I think it's the fact that every step is important. Even if you run, you need to run carefully to avoid stumbling. You need to pay attention so you don't walk off the trail and get lost. You need to be present to each moment. You need to appreciate the journey. and the carnival follows with an amazing number of links! I have been homeschooled since kindergarten. This has been a great gateway to many opportunities, like travel and making friends in different grades. I love the flexibility. Last year I did all my classes online, and had a math tutor. That was my freshman year. This fall I will be doing something different. I will be taking classes twice or three times a week at a nearby private school. I’m looking forward to the group learning. I will still be doing other classes online for subjects that I’m not doing at the private school. I will be doing English and Science at the school, with an extra computer programming class. The other classes I will be doing either online or through books or other programs. When you homeschool you get to do what works best for you, even if that means mixing and matching programs. I like this because people aren’t in cookie cutter shapes. 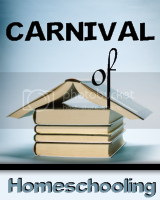 This is just a quick reminder, you have a week to send in up to three posts about homeschooling for the July edition of the Carnival of Homeschooling. The July edition of the Carnival of Homeschooling will be at Home Spun Juggling. Please send in the entries by July 13th at 6:00 PM PST.